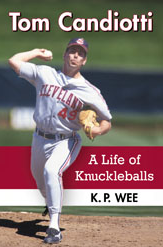 “Tom Candiotti: A Life of Knuckleballs,” the biography of former Major League Baseball knuckleball pitcher and current Arizona Diamondbacks broadcaster Tom Candiotti, is now available from McFarland & Company or through Amazon.com. In this biography, Candiotti shares his thoughts on being the second player ever to come back from Tommy John surgery, the knuckleball, and losing the ERA title race to Roger Clemens, among other things. Candiotti also discusses some of the favorite pranks he pulled off with David Wells. Meanwhile, for a list of McFarland’s Spring 2014 new titles, click here. Their sports 2014 catalogue can be found here, and it contains a discount code that can be used for purchases up until September 1, 2014! To get their latest updates and happenings, follow McFarland on Facebook as well as on Twitter! Since I worked for a couple of summers with the Vancouver Canadians baseball club (2011-2012), I’ve had enough ballpark food to last me for a while! However, like many people in Vancouver, I just can’t stay away from the beautiful ballpark that the Canadians play in, Scotiabank Field at Nat Bailey Stadium. The game I attended on Sunday, August 10 against the Tri-City Dust Devils marked the 10th sellout of the season for the Canadians in 24 home games in 2014. The club has already set five consecutive attendance records since 2009 and appear to be on its way to another new mark this summer, having already had several more sellouts for the remaining games of the 2014 home schedule. Ironically, though, this game was only my third one back since the end of the 2012 season, but it was great to return and catch batting practice as well as speak with the play-by-play broadcasters on both sides. This particular game also marked the Vancouver debut of Matt Smoral, a 6’8”, 220-pound, hard-throwing left-hander who was selected by the Toronto Blue Jays (the Canadians’ parent club) in the first round (50th overall) of the 2012 Major League Baseball amateur draft. Just as important on this night, both the Canadians and Dust Devils were battling for the North Division second-half pennant in the Northwest League – each club was a game out of first place with only three weeks remaining – so it was quite an exciting night indeed. What a treat indeed at the ballpark, and I got to enjoy every minute of it from their air-conditioned press box. On to the game, which was the opener of a three-game series between Vancouver and Tri-City. Both the Canadians (7-9) and Dust Devils (7-9) trailed the Everett AquaSox (8-8) going into tonight’s action, with only 21 games remaining after this one. Then after this series, the Canadians would welcome the first-place AquaSox in for three games at Scotiabank Field, so it was definitely a huge homestand for Vancouver. Ryan Borucki, a 20-year-old left-hander making his second appearance with the Canadians (first in Vancouver), got the start. Borucki, selected in the 15th round of the 2012 amateur draft by the parent Blue Jays, allowed the first two Dust Devils to reach base (via a hit batsman and a walk) but bounced back to get the next three hitters – two by strikeouts – to escape the inning unscathed. The Canadians struck first in the bottom of the opening inning off left-hander Helmis Rodriguez (signed as a non-drafted free agent by the parent club Colorado Rockies in 2010) thanks to a bases-loaded walk and an infield single. It was an unlucky beginning for the hard-luck Dust Devils starter, who came in with a 3-6 record despite a 2.14 ERA in 11 starts, as two of Vancouver’s first three hits didn’t even leave the infield. The fourth hit he gave up, meanwhile, was a grounder that bounced off Tri-City shortstop Chris Rabago’s glove and into centerfield. For a while, it looked as though the Canadians would hang on to that lead with the way Borucki was pitching. However, Tri-City third baseman Shane Hoelscher led off the top of the fourth with a home run over the leftfield wall, the first round-tripper of his professional career, to put the Dust Devils on the scoreboard. A sacrifice fly the following inning evened the score at 2-2. Smoral, a 20-year-old drafted out of Solon High School (Ohio) in 2012 who was just called up from Bluefield (Appalachian League) three days earlier, took over on the mound in the top of the sixth inning for his Canadians debut. But it wasn’t a great debut for the tall left-hander. Smoral recorded only two outs, gave up two hits, threw two wild pitches, hit two batters, issued a pair of bases on balls, and allowed three runs, including one that came home on a bases-loaded walk. Thanks to the young lefty’s wildness, the Dust Devils plated three runs to go ahead 5-2. Second baseman Renaldo Jenkins added an RBI double off right-hander Andrew Case to put the Dust Devils up 6-2 in the top of the seventh, before Vancouver stunned Tri-City by erupting for three runs in the bottom of the inning and then two more in the eighth – with the go-ahead run coming home on a bases-loaded hit-by-pitch – to take a 7-6 advantage. With Vancouver needing only three more outs to pull into a first-place tie in the North Division, the Canadians instead gave up five runs in the top of the ninth. The Dust Devils loaded the bases with none out on a single and two walks, before first baseman Josh Fuentes singled to left, where Christopher Carlson overran the ball. All three runners scored, putting the Dust Devils ahead to stay, 9-7. A wild pitch by Canadians reliever Joseph Lovecchio plated Tri-City’s 10th run of the afternoon, before catcher Robbie Perkins singled home yet another run to make it 11-7. Vancouver (7-10) went down quietly in the bottom of the ninth, allowing Tri-City to pull out the victory in the opening game of this three-game set. Thanks to Everett’s loss to Spokane – the AquaSox (8-9) were held hitless over 11 innings in their 3-0 defeat – the Dust Devils (8-9) were now tied for first place in the North Division with only 21 games to play. A great game, and thanks to the Vancouver Canadians Media Relations Department for their hospitality, and also thank you too to Dust Devils play-by-play broadcaster Chris King for spending a few minutes after the game to chat with me.